Town officials might soon move the town office from this Main Street building, as seen on Thursday, Aug. 21, 2014. Lincoln’s town office is temporarily moving after a State Fire Marshal’s Office inspection revealed 33 code violations at the building at 63 Main St.
Town workers have been moving out of the office since the Town Council voted 6-1 on Feb. 11 to sign a temporary lease for two storefronts at 29 Main St., which was home to a Machias Savings Bank branch. Jeff Gifford, a member of the local Masons group that owns the 63 Main St. building, cast the opposing vote. The town has signed the new lease to 29 Main St., and it has begun paying $2,000 a month, Town Manager Rick Bronson said. The move will be completed by March 29, he said. 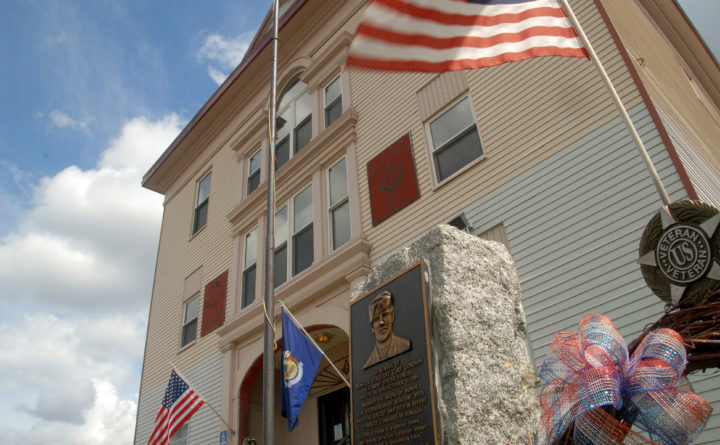 The move is the culmination of disputes stretching back to 2004 created by what town officials have described as the poor condition of the town office building, inadequate maintenance by the building’s owner and the membership of some town council members in the local Masonic lodge that owns the building. Members of Horeb Masonic Lodge No. 93 of Lincoln have said the building has been a good bargain for the town in a great location to support downtown businesses. They have denied being bad landlords or that the building is in bad shape. The vote to move was based on the fire marshal’s report from a Dec. 20, 2018, inspection, plus other inspections by state electrical inspectors, a town-hired architect, insurers employed by the Maine Municipal Association and the Maine Department of Labor SafetyWorks Division, Bronson said. The inspectors all found significant safety or structural flaws in the building that would have to be addressed if town workers were to continue working there, Bronson said. The fire inspector’s 33 violations include a lack of safety devices in the building, including no third-floor sprinkler system. The inspector also found no fire-resistant assemblies between floors or fire doors to the boiler room. The fire marshal’s inspection found plastic on the ceilings and walls that needs to be removed, as well as several non-functioning emergency lights. The building also needs more such lights, and a second-floor fire escape must also be reinstalled, according to the seven-page inspection report. The town office is on the first floor of the three-story building. The town uses the second floor for storage, while the Masons use the third floor. Both have occasionally used the basement as a meeting room. The Masons “feel the ‘dangers’ of continuing to use the present building (and these dangers have not significantly changed over the past hundred years) have been grossly exaggerated,” Masonic Lodge member Carl Stewart wrote in a Feb. 24 email to the council, Bronson and what appears to be several Masons. The BDN obtained the email through a public records request. The inspections were prompted by concerns about the building’s safety, its fitness as a town office and the fire marshal’s office not having inspected the building in years, Bronson said. The old lease, under which the town pays $1,200 a month plus heat, sewer, water and three of the four electrical meters to the building, lapsed as of Feb. 1. After Feb. 1, the town began paying $1,200 plus electric each month, and the Masons began paying the rest, Bronson said. The move to the new building will continue, Bronson said, even as the town pays rent for both town office spaces. “Given what needs to be done to this building, there’s no way we can stay in here and continue to operate during the construction, if construction happens,” Bronson said.